With Valentine’s Day less than a week and a half away, couples everywhere are scrambling around to find the perfect gift for the most romantic day of the year. Luxury watches make great presents, combining elements of jewelry and mechanics into beautiful and practical objects that can be worn and used every single day. 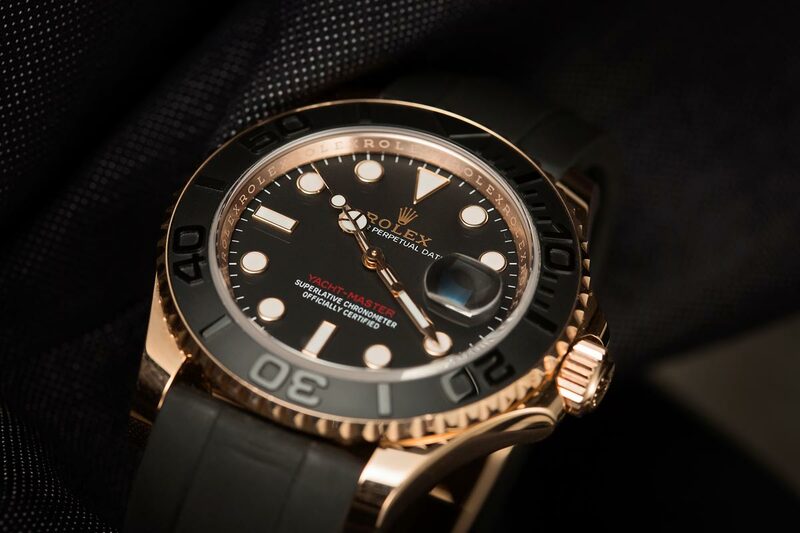 When it comes to watches that epitomize this ethos, there is possibly no better option than Rolex. From rugged and refined tool-watches to gem-set jewelry timepieces, Rolex manufactures a watch for every lifestyle and every wrist. If you are thinking about buying a timepiece for your loved one this Valentine’s Day, then read on for some of the best watches that say, “I love you” to that special someone in your life. 36mm Rolex Datejust watches look perfect on just about every wrist size. The design of the Rolex Datejust is absolutely timeless, making it the perfect Valentine’s Day gift. The Datejust is the quintessential Rolex watch. Since 1945, countless world-leaders and celebrities have worn Datejust watches, and it is this model that Rolex gives to the recipients of its various philanthropic awards. 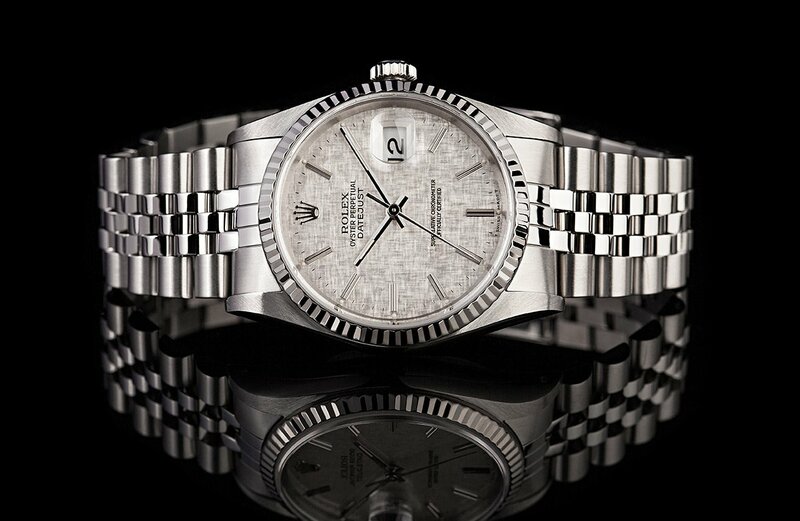 Additionally, for many individuals, the Datejust was the Rolex that was worn by their parents. The ref. 16233 is the classic, stainless steel and yellow gold version of the iconic Datejust that sports a 36mm case, which works perfectly on both male and female wrists of almost any size. If the two-tone look is not to your aesthetic preferences, the ref. 16234 is the stainless steel and white gold version that offers identical functionality in a more subtle and subdued package. Additionally, due to the wide variety of dial options available for these two great watches, they can be found with appearances that range from glitzy and luxurious to sporty and understated. Fitted with a diamond bezel, the Rolex Datejust ref. 116244 makes a perfect gift for your special someone this Valentine’s Day. For a modern take on a classic, the ref. 116244 is the most recent version of Rolex’s 36mm all-white metal Datejust that is fitted with a diamond-set bezel. With solid center-links, slightly thicker lugs, and a ring of gleaming diamonds around the face of the watch, this version of the Datejust offers quite a bit more wrist-presence than it predecessors, while still adhering to the overall design of the classic collection. Lastly, still within the Datejust collection is the entirely yellow gold, ref. 68278 mid-size Datejust on a President bracelet. 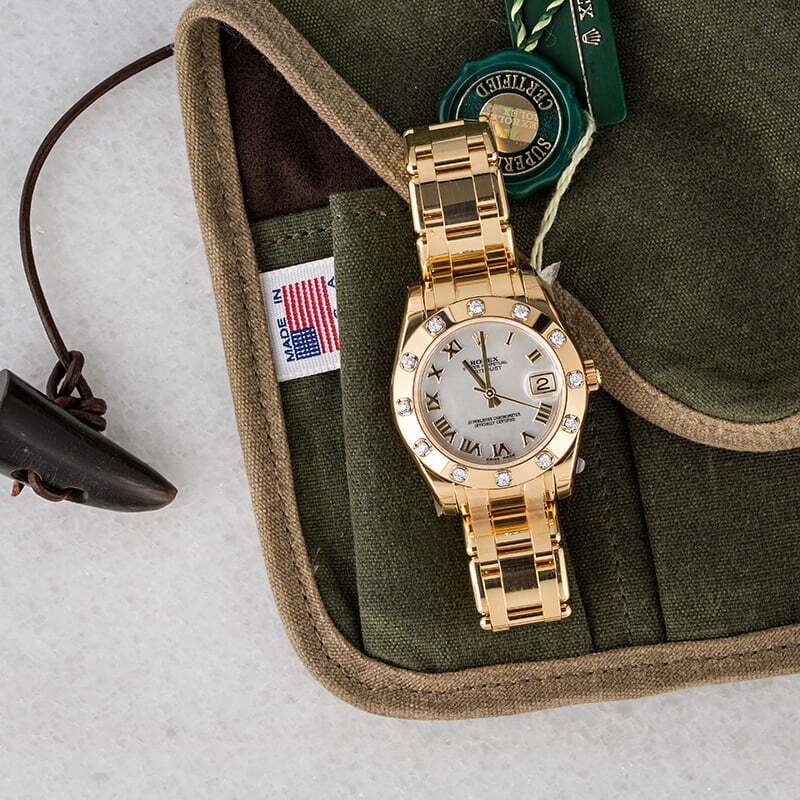 At 31mm in diameter, this watch is noticeably smaller than the standard 36mm case size, yet significantly larger than the 26mm and 28mm “Lady President” models, making it a perfect Valentine’s Day gift for those looking to get their significant others a matching watch to go with their classic Day-Date President. 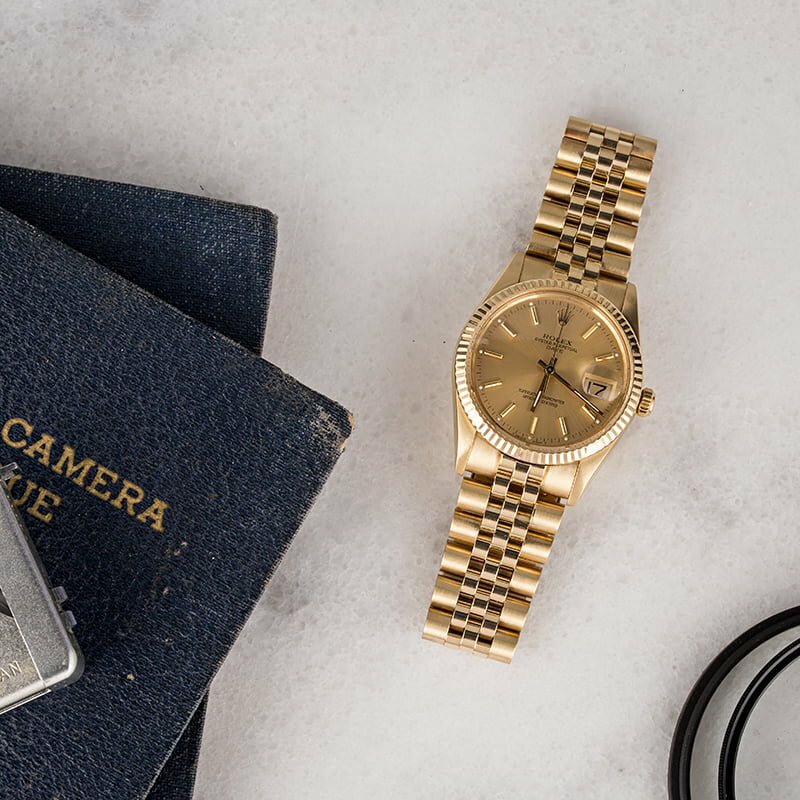 At 34mm in diameter and craft from solid 14k yellow gold, the Rolex Date ref. 15037 is a perfect vintage Rolex to give your signifiant other on Valentine’s Day. If 36mm is too large and 31mm seems a bit too small, then the 34mm Rolex Date should be just right. Identical in functionality to both the larger and smaller Datejust models, the Rolex Date is perfect for your loved one who always seems to be caught in-between sizes. The ref. 15037 is a fantastic vintage option within the Rolex’s Date collection. Craft entirely from 14k yellow gold and fitted with an acrylic crystal, this watch checks all of the boxes for Rolex’s signature design traits, but offers a subtly more vintage overall look and feel than more modern Rolex Date references. Craft from stainless steel and fitted with an 18k white gold fluted bezel, the Rolex Date ref. 115234 is a thoroughly modern take on Rolex’s classic Date collection. If vintage is not your thing, then the ref. 115234 is a thoroughly modern, stainless steel and 18k white gold take on the classic 34mm Rolex Date design. Like other watches in Rolex’s current catalog, this timepiece has slightly thicker lugs and solid center-links for its bracelet, giving it noticeably more presence on the wrist than older watches. 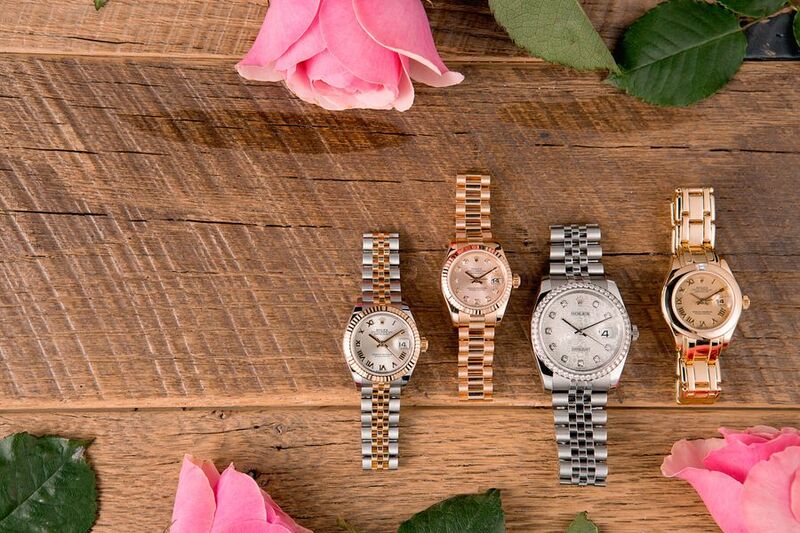 The Pearlmaster is Rolex’s collection of jewelry-oriented watches – a perfect choice for Valentine’s Day. If the Datejust sounds perfect, but you want to go all out and get the love of your life the most luxurious and opulent interpretation of it that Rolex has to offer, then the Pearlmaster is the watch to give that very special someone. 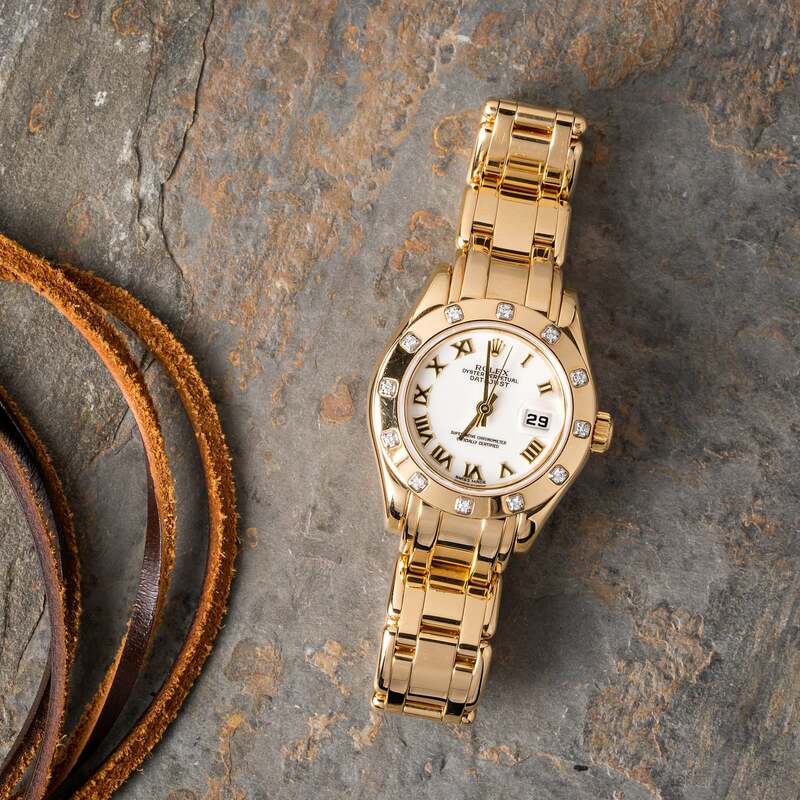 Exclusively craft from precious metals and set with some of the most perfect diamonds that Rolex has to offer, the Pearlmaster collection is where horology meets jewelry, creating some of the most exclusive timepieces in the Rolex’s catalog. 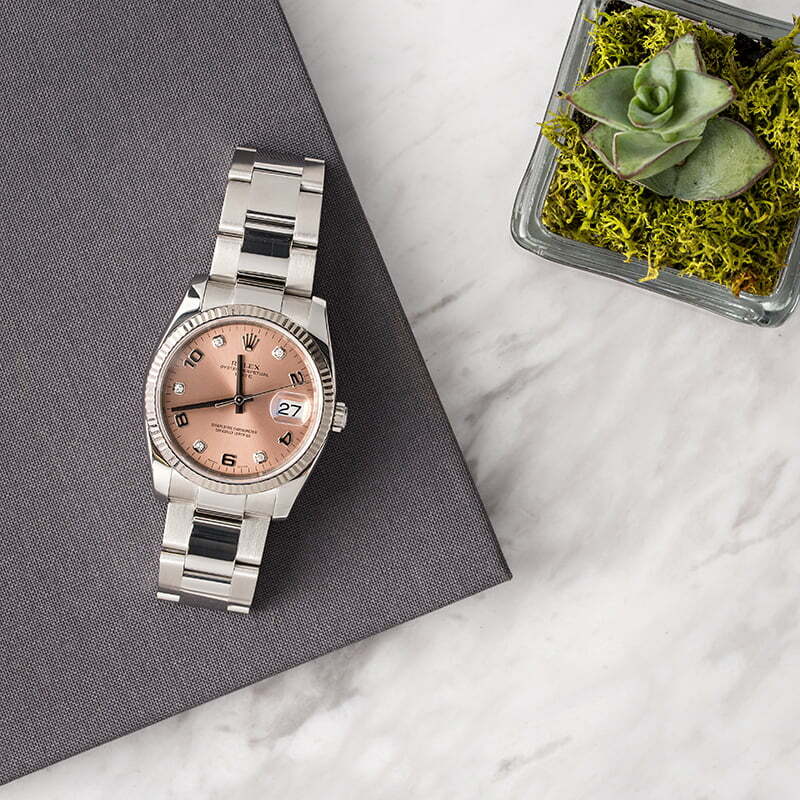 Larger than the traditional Lady Datejust, the 29mm ref. 80318 Pearlmaster is the entirely 18k yellow gold version, fitted with a bezel that is set with 12 brilliant diamonds. The slightly larger and more curved case is complemented by its unique Pearlmaster bracelet – a seldom-seen bracelet style that is reserved exclusively for Rolex’s most luxurious gem-set watches. Rolex Pearlmaster watches are fitted with special Pearlmaster bracelets that are exclusively used on Rolex’s collection of gem-set Datejust watches. Now, if the Pearlmaster seems perfect but 29mm is just a little bit too small, then the 34mm ref. 81318 should be ideal. Identical to its smaller counterpart in every way – from its solid 18k yellow gold construction to its Pearlmaster bracelet and diamond-set bezel, this is very much the same watch, just in a slightly larger (but still just as refined) package. The Everose gold used for the construction of the Rolex Yacht-Master will never fade or lose its warm pink tones. On the more modern and sporty side of the Rolex catalog, we have the Yacht-Master collection, which blends luxury and sports-forward styling into a contemporary and highly attractive package. Similar in its overall design language to many of Rolex’s other sports watches, the Yacht-Master is a more luxury-oriented interpretation, which is perfect for your loved one who may love the way that your Submariner or GMT-Master looks, but may not need the full extent of its tool-watch capabilities. The Yacht-Master is Rolex’s luxury-oriented interpretation of a modern sports watch. While the Yacht-Master is available in a number of different sizes and metal configurations, the ref. 268655 would be our pick for Valentine’s Day this year. Craft from 18k Everose pink gold, and fitted with a black ceramic bezel and a black rubber strap, this 37mm Yacht-Master is a slightly smaller version of the full-size 40mm model, and since it is made from Rolex’s proprietary Everose gold, this watch’s warm pink tone will last forever – just like the love that you share! (you can thank us later if you end up using that line when you give this watch). 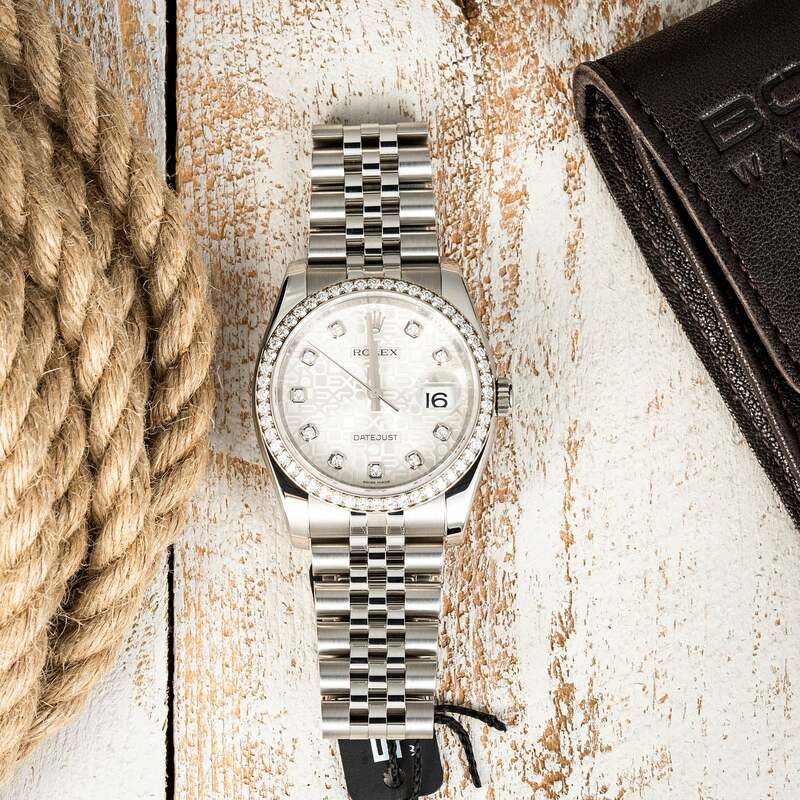 The Explorer is Rolex’s original line of sport watches. The Explorer is Rolex’s original line of sport watches, and offers a no-nonsense, utilitarian aesthetic, which still somehow manages to remain refined and classically beautiful. 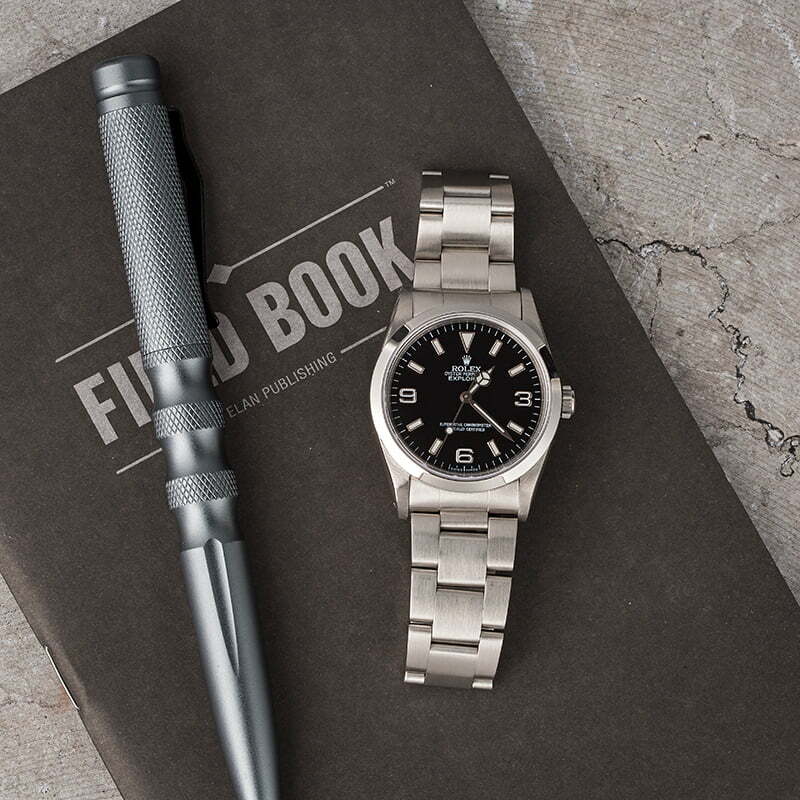 Only ever craft from stainless steel and available with a black dial, the Rolex Explorer is a tried and true classic that looks at home (and amazing) on quite literally every wrist that wears it. The current model Explorer has seen a size increase; however the ref. 14270 is the traditional 36mm version that still benefits from modern enhancements such as applied hour markers and a scratch-resistant sapphire crystal. Additionally, with its iconic 3, 6, 9, ‘Explorer-style’ dial, this is a watch that is going to look just as good several decades from now as it does today. 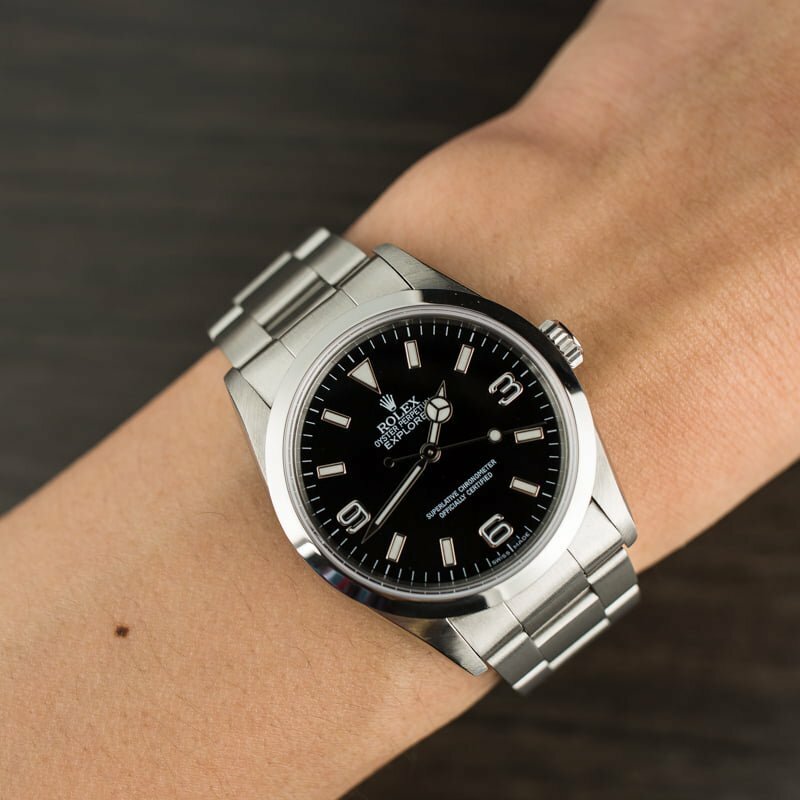 On the days when your significant other does’t wear the new Rolex Explorer that they got for Valentine’s Day, the watch will look just as good on your wrist! If you wanted to get that special someone in your life a watch that they could wear – in every possible situation, ‘till death do them part – then a Rolex Explorer would certainly not be a bad option. And on the days when they don’t wear it, the watch’s highly versatile styling means that it will look just as good on your wrist too – there is absolutely no problem in sharing. After all, that’s how relationships work right?